I took the girlfriend for a quiet drink at a lovely little pub called The Grenadier in central London. But it wasn’t so quiet! We were joined by a group of Officers from The Grenadier Guards who were all smartly turned out in their traditional bowler hats and chalk stripe suits enjoying a sports drink before their annual memorial. A collection of brave young men from one of the most traditional regimentsof the British Army. See also: bowler hats, brave young men, central London, girlfriend, Grenadier, grenadier guards. 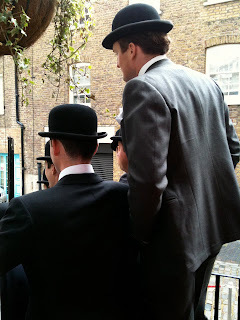 bowler hats Archives - Bespoke Suits By Savile Row Tailors.